If you would like to visit BEG, please contact the Hocking SWCD at 740-385-3016. 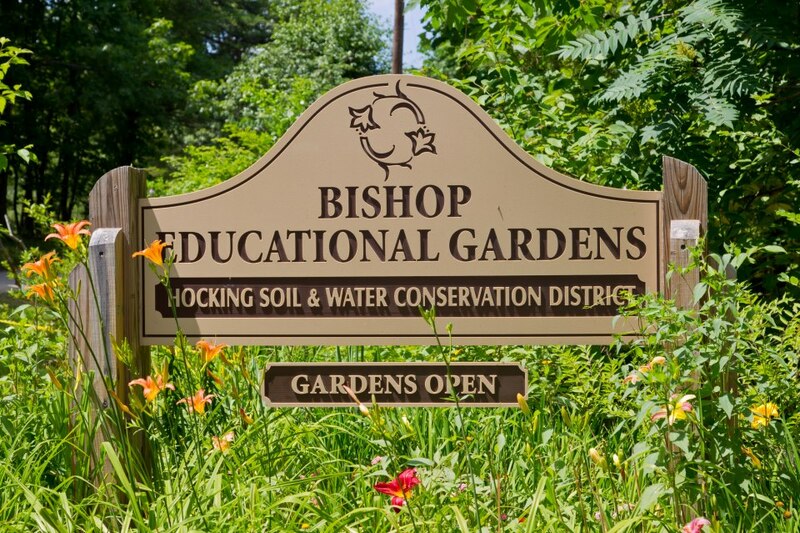 The Bishop Educational Gardens is a 36 acre parcel of land that was donated to the Hocking Soil & Water Conservation District on December 12, 2008. As retired teachers Roberta Bishop and her late husband Bruce dreamed that one day their property would be used for outdoor education. After working with the Hocking Soil & Water Conservation District, they decided that this would be the right hands for their property to fulfill their dreams. Workshops for adults like the Garden Workshop, Ohio Certified Volunteer Naturalist Classes, Rain Barrel Workshops, Winter Hikes and of course the famous Lilyfest are held here. Field Trips for school children, home school programs and family outdoor programs are also possible due to this generous donation. Additionally, the gardens received another special gift of a tree identification nature trail in honor of the late Paul B. Hoskins this past spring. Paul was a former biology teacher, worked for the Ohio Department of Natural Resources and served as the Pickaway County Soil & Water Conservation Supervisor. On his unexpected passing, family requested that in lieu of flowers donations be made to construct a trail in his name. On July 11, 2009 the Paul B. Hoskins Nature Trail was dedicated at Lilyfest. The trail is used for education programs, available for FFA groups, Forestry Team, home school programs, adult hikes, tree identification hikes and more. But our blessings did not stop there!! The family of Jean Flynt Wilder, of North Carolina (Paul B. Hoskins cousin) decided that in her memory, they too would donate to the Paul B. Hoskins nature trail. Many thanks go out to these families to their continued dedication of outdoor educational opportunities for the future stewards of our land. Lilyfest Parking Lot Volunteers, Greeting Table Volunteers, Trail volunteers. project contact the Hocking SWCD for more details. If you are a college student or know of a college student that needs practicum hours, contact the Hocking SWCD and we will work with your summer schedule. This is an unpaid volunteer opportunity but is a great resume builder.